As the Ebola outbreak in Africa continues, and two patients receive treatment in the U.S., most Americans have at least a fair amount of confidence in the government’s ability to prevent a major outbreak of Ebola in the U.S. In addition, relatively few are concerned that they or a family member will be exposed to the virus. The new national survey by the Pew Research Center, conducted Oct. 2-5 among 1,007 adults, finds that 20% say they have a “great deal” of confidence in the federal government to prevent a major outbreak of Ebola in the U.S., while another 38% say they have a “fair amount” of confidence. Fewer than half express “not too much confidence” (24%) or “no confidence at all” (17%) in the government to prevent a major Ebola outbreak. So far, the Ebola virus has not led to widespread concern about personal health: Just 11% are very worried that they or someone in their family will be exposed to the virus, while another 21% are somewhat worried. Two-thirds say they are either not too (37%) or not at all worried (30%) about contracting Ebola. Public concern over the possibility of contracting the Ebola virus is lower than for other recent public health threats. In August 2009, 45% were worried about the possibility of being exposed to swine flu, and in November 2005, 38% worried about contracting bird flu. Republicans are much more skeptical than Democrats and independents about the government’s ability to prevent a major Ebola outbreak in the U.S.
By more than two-to-one, more Democrats say they have a great deal or fair amount of confidence in the government to deal with Ebola (69%) than not much or no confidence at all (28%). 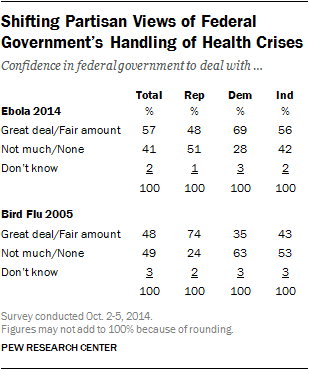 Independents also are confident in the government’s ability to prevent an Ebola outbreak in the U.S. (56% vs. 42%). Republicans are divided: About as many say they have little or no confidence (51%) in the federal government to prevent a major Ebola outbreak as say they have a great deal or fair amount of confidence (48%). In November 2005, amid concerns over an outbreak of bird flu, Republicans were far more confident than Democrats in the government’s ability to prevent a major outbreak. At that time, shortly after the Bush administration was widely criticized for its response to Hurricane Katrina, 74% of Republicans and just 35% of Democrats expressed confidence in the government’s ability to deal with a possible bird flu outbreak. Nearly half of blacks (47%) and 39% of Hispanics say they are very or somewhat worried about being exposed to the Ebola virus. By contrast, just 27% of whites are worried about getting the virus. Women (37%) are somewhat more concerned than men (27%) that they or someone in their family will be exposed to Ebola. Concern over Ebola exposure is higher among those with less education. Only about one-in-five college graduates (22%) say they are worried about being exposed to the Ebola virus. By comparison, 34% of those with some college experience and 38% of those with no more than a high school diploma say they are worried that they may contract Ebola.